As you likely already know from personal experience, a home can never have enough storage space. Ample room to put your stuff isn’t just a practical consideration, either; houses with lots of extra storage tend to be more appealing to buyers and help to elevate their overall resale values. One of the best things about building a custom home in Calgary is that you’re free to get creative with your storage space. You’ll never have to deal with clutter, and the added space will give your home a boost if you ever decide to sell. Built-in storage. Living rooms and bedrooms can be designed with extra storage space; build large drawers or cabinets right into the walls, and watch clutter disappear like magic. Empty space conversions. Got some unused space hanging over a doorway? Turn it into a book shelf! Are there vacant walls begging to be put to better use? Add shallow shelving. Whenever and wherever possible, convert empty space into storage space. Have furnishings double as storage units. All kinds of furnishings can be customized to include storage space. Full-length mirrors can open up to give you added space for storing small goods. If you’ve got benches built into your breakfast nook, design them to incorporate drawers below the seating so the space goes to good use. Overhead storage. One trendy idea is to use overhead space for storage by leaving the ceiling open. Narrow rafters and lengths of wood can be used to stabilize the space, leaving you with plenty of places to put boxes, trunks, luggage and other large or bulky items. Staircase storage. Just when you thought there was no way to improve on the design of the classic staircase, this idea comes along: have the risers double as drawers! You’ll enhance their functionality and look awfully clever while doing it. Hidden storage. 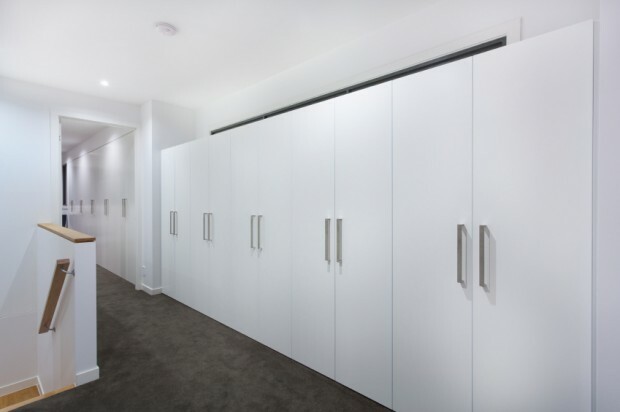 Anytime you’ve got a furnishing or appliance built into the wall, you’ve got an opportunity to add hidden storage. Look below or behind the area to see if there’s any way you can sneak some extra storage space into the arrangement. You can also check online for photos. Home decor websites are a great resource, and there are visual references to stimulate your imagination! Regardless of whether your garage is attached or detached, this area of your home tends to see heavy usage for storage. It’s important that you always follow proper safety guidelines when it comes to storing toxic or flammable items in your garage, so be sure to take this into account whenever you’re assigning functions to space. Unique storage options are just one of the countless custom features you can enjoy when you build with Fine Line Homes. From unique floor plans to luxurious touches, you have complete freedom to create the house of your dreams when you work with our architectural, engineering and creative professionals. To learn more about our homes and our proven design and construction process, please register with Fine Line Homes to receive your free, no-obligation information package.